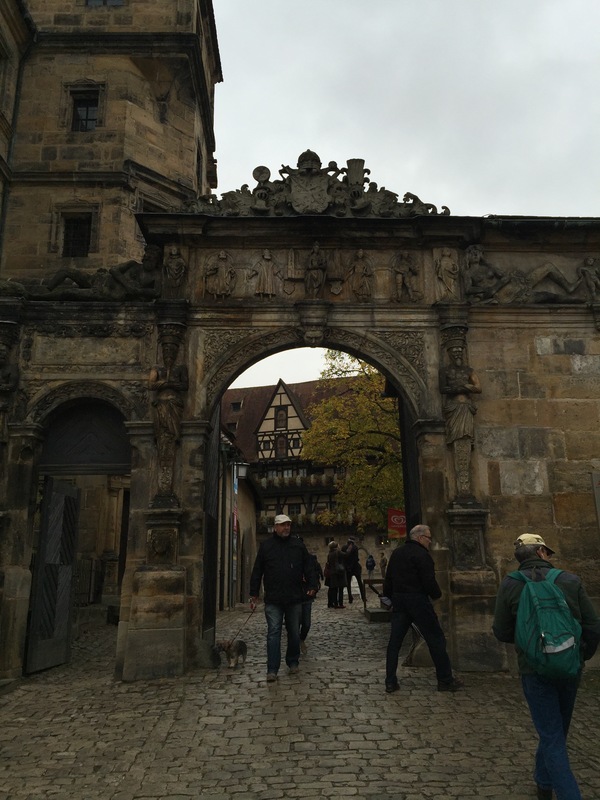 On Thursday, we had a choice of going to Wurzburg or Rothenburg. 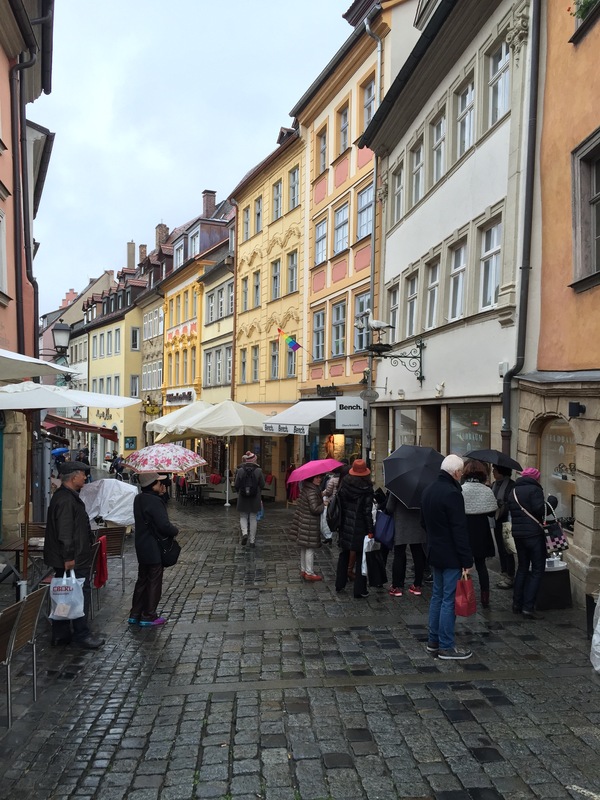 I joined Kati in Wurzburg, along with about 20 guests. 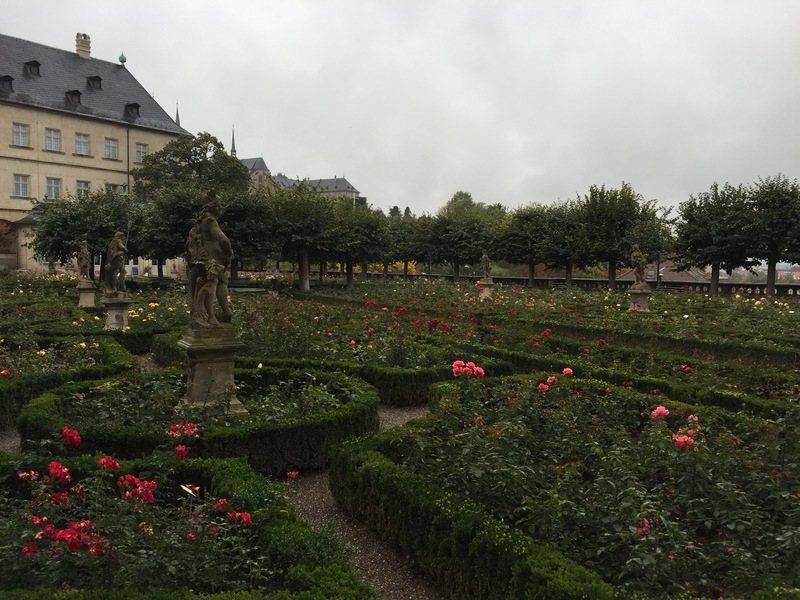 Wurzburg is a city in southwestern Germany, in the state of Bavaria, on the Main River. It is a railroad junction, and industrial center, and the commercial hub of an agricultural region noted for its’ vineyards. After a short 10 minute coach ride, the group arrived near the city center. 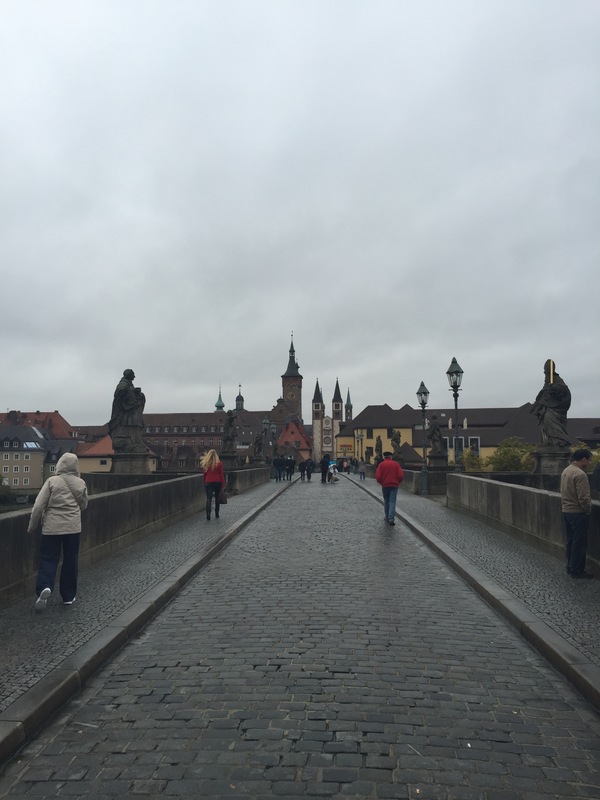 We crossed the stone bridge which is the oldest that is still on the Main, built around 1120-1130. 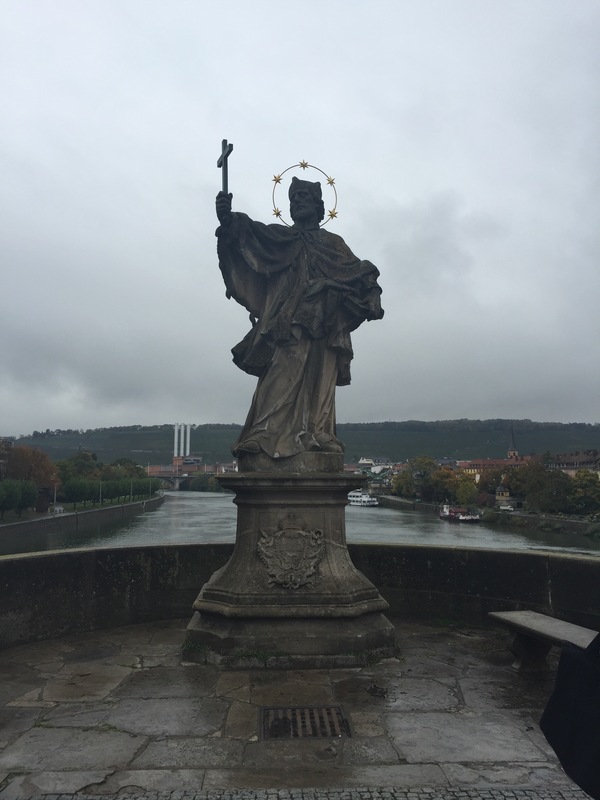 Once across the bridge, we started with a scattered lunch – everyone ate at different places. 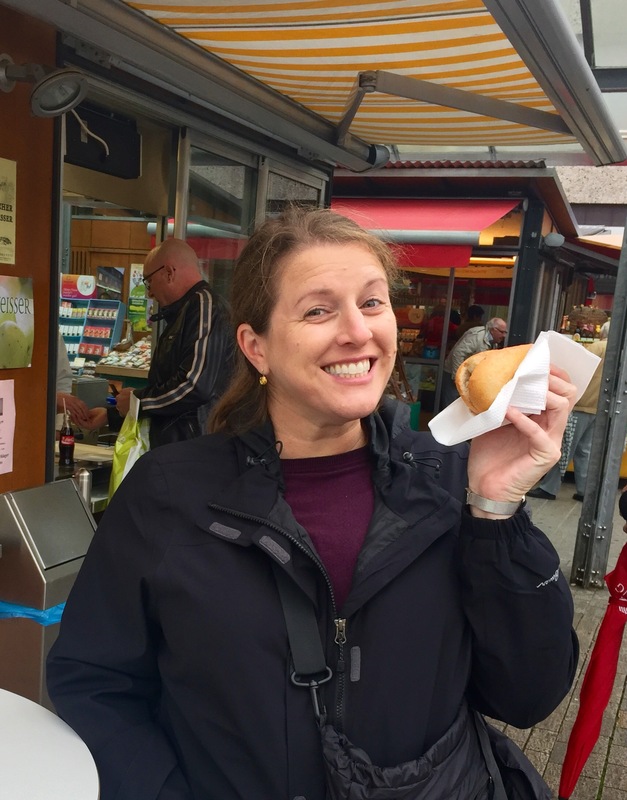 Kati and I enjoyed an authentic Bratwurst – it was actually my first Bratwurst ever and it was delicious! 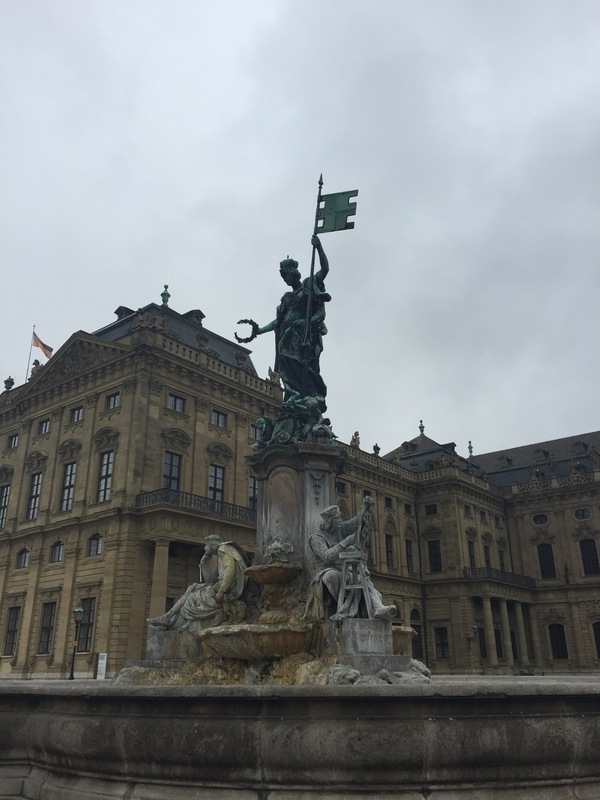 After lunch, Kati gave me a quick tour of the important TD sites – bathrooms, ATMs, post office, etc… A short while later, the group reconvened to walk over to the Wurzburg Residenz. 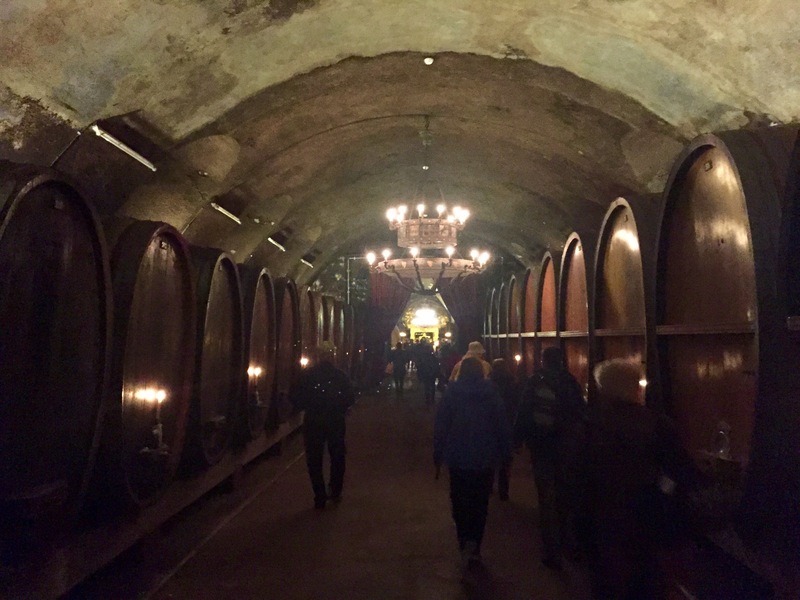 We were treated to a guided tour that concluded by going to the intimate Hofkeller (cellar) of the Residenz for a private wine tasting. 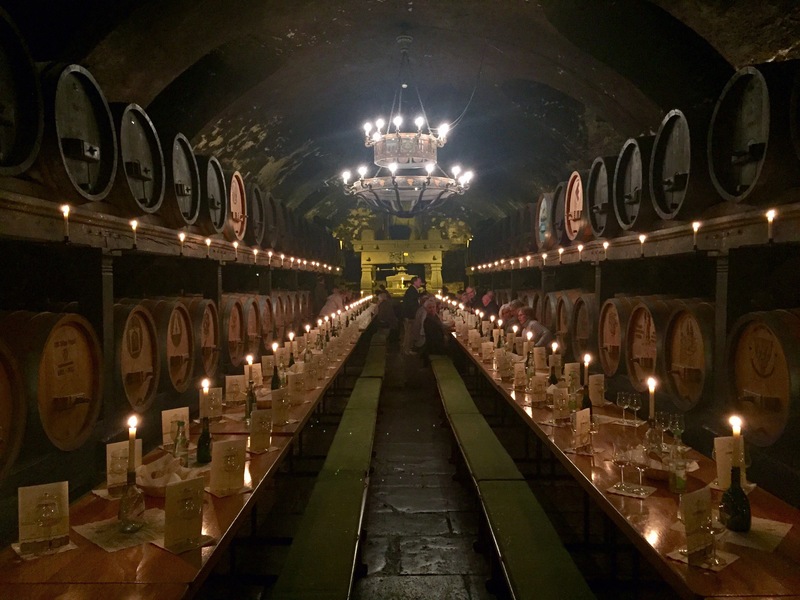 Wurzburg is in the Franconia region which is well known for its’ lush white wines, specifically those from the Silvaner grape. We had a morning of sailing on Friday….through lock after lock after lock. It really is quite fascinating to watch the entire process. I have a feeling that Ethan would enjoy watching the lock routine. 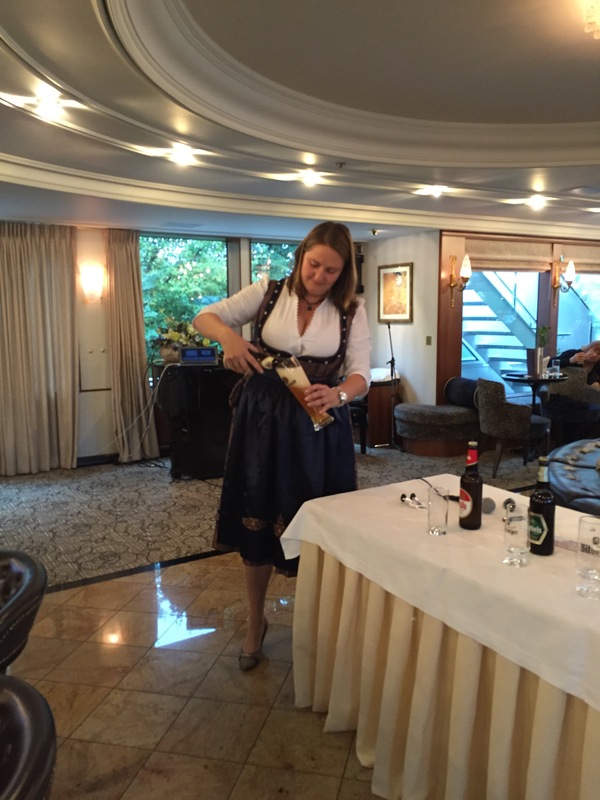 As we continued to sail, Kati gave a lecture in the main lounge entitled “Germany Geography: One Beer at a Time.” Kati and Anke each wore a proper Dirndl and Emil wore a Lederhosen apron. 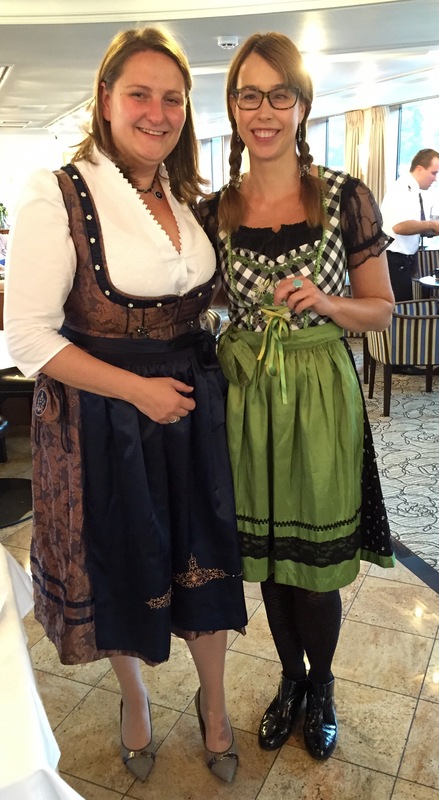 Anke explained that the bow on the front of a dirndl skirt can tell you about the girl wearing it. If the bow is tied on the right side, the girls is taken – married or in a relationship. A bow tied directly in the front indicates being divorced or widowed. A bow tied on the left means that the girl is available, while a bow tied in the back indicates that she is waiting tables. We should have a system like this in the states! Kati started with the basics of the four ingredients that go into beer: water, yeast, hops, barley/malt. She talked about the stages of beer making…malt and water are heated to make Wurt and then the starch from the malt gets converted to sugar. Then it is put into the brew kettle and hops are added. Hops are the most important, most expensive ingredient and there are many different kinds of hops. Everything then goes into the fermentation tank, where yeast is added and converts the sugar into alcohol. The last step is the conditioning tank where the beer is stored until it is filtered and bottled. 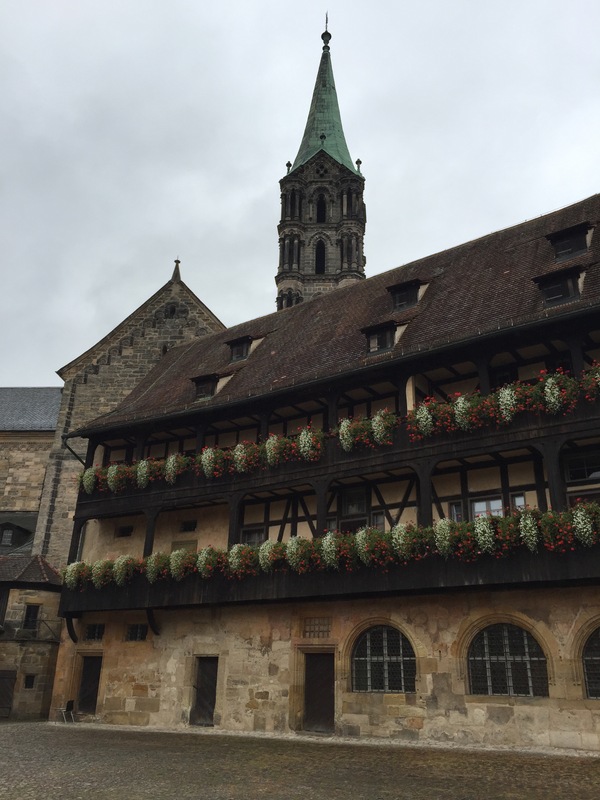 A little about breweries in Germany: there are 1,352 breweries and all beer roads lead to Munchen (Munich). Munich has the biggest beer halls and gardens which can hold an average of 8,500 people, with the largest holding 10,000. At proper beer gardens and tents, there are no tables for two or four…everyone sits at massive, long tables with friends and strangers alike. Oktoberfest takes place in Munich each year and the mayor of Munich is responsible for opening the celebration rah year by tapping the first barrel of beer. Germany has the second largest yearly beer consumption rate per person at 108 liters per person, only behind the Czech Republic which averages 160 liters per person. That’s a LOT of beer! 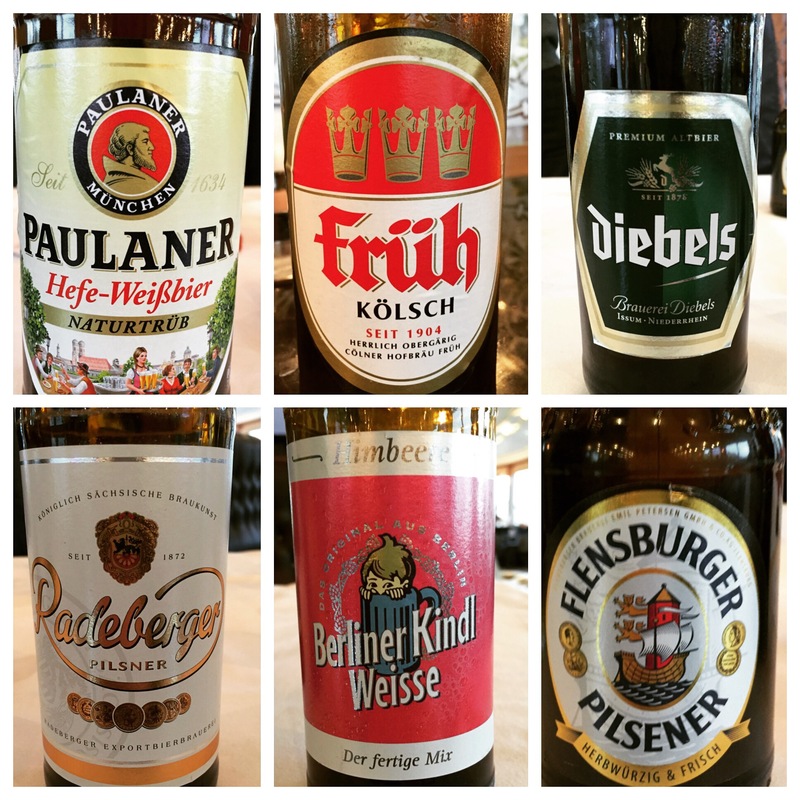 During Kati’s presentation, we sampled six different German beers: Paulaner, Fruh, Diebels, Radeburger Pilsner (which is shown every season of Two and a Half Men), Berliner Kindl Weisse and Flensburger Pilsener. 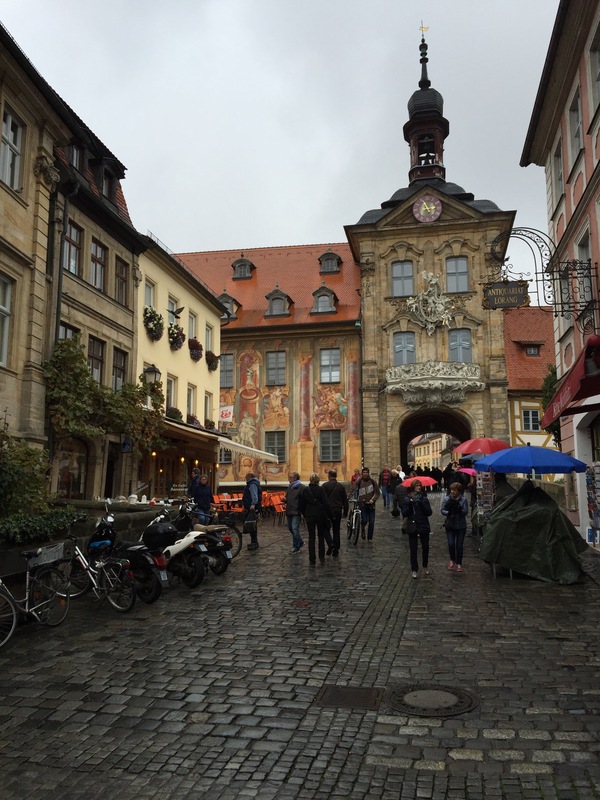 After lunch, we arrived at the port in Bamberg, Germany. 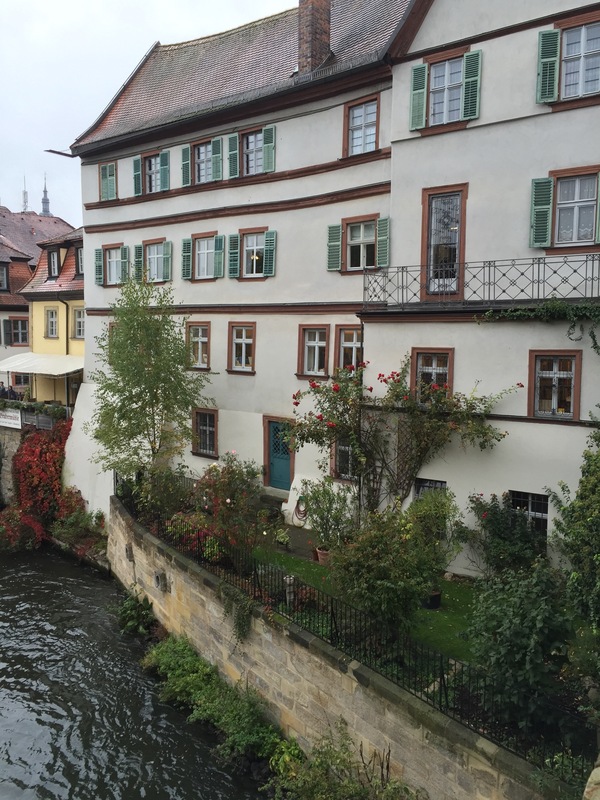 Bamberg is a city in Bavaria located in the Upper Franconian on the river Regnitz, close to the Main. 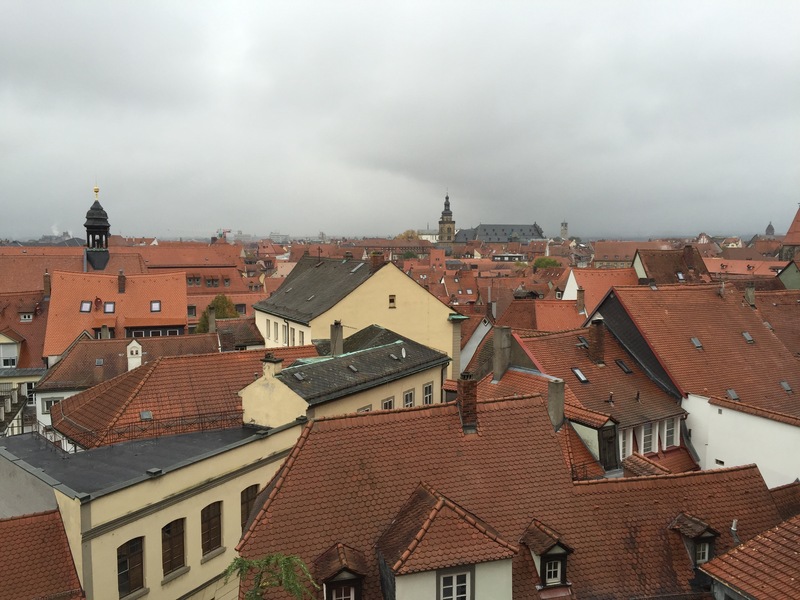 Its’ historic city center is a listed UNESCO world heritage site. 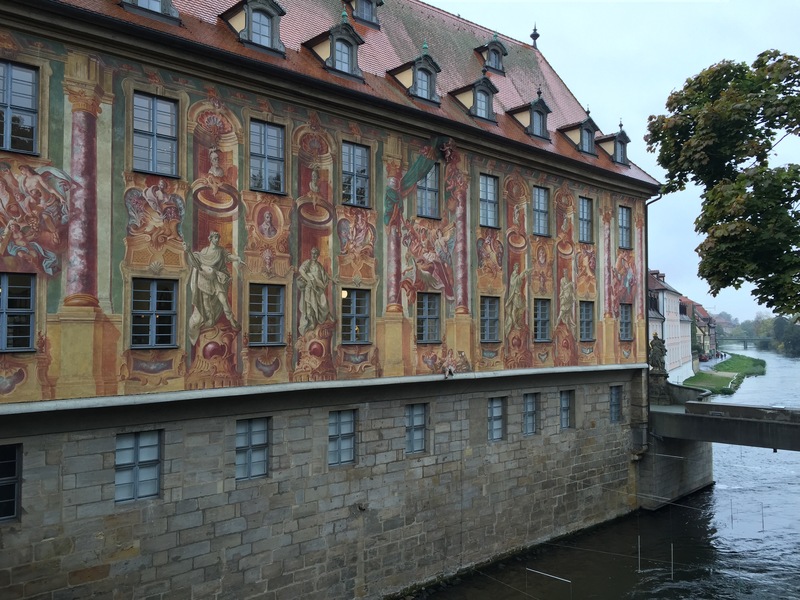 Bamberg is a representative example of an early medieval town in Central Europe, both in plan and its’ many surviving ecclesiastical and secular buildings. 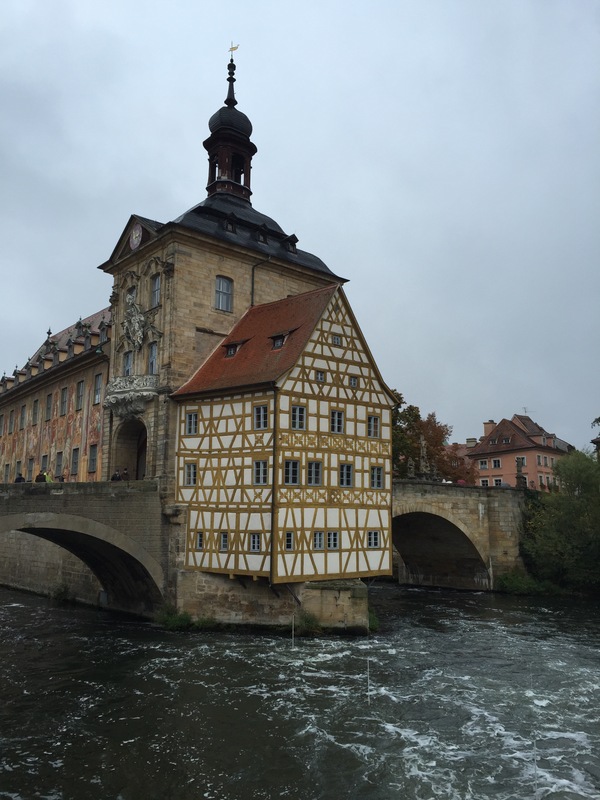 Miraculously, Bamberg emerged from World War II with hardly a scratch, leaving most of the original buildings still standing today. 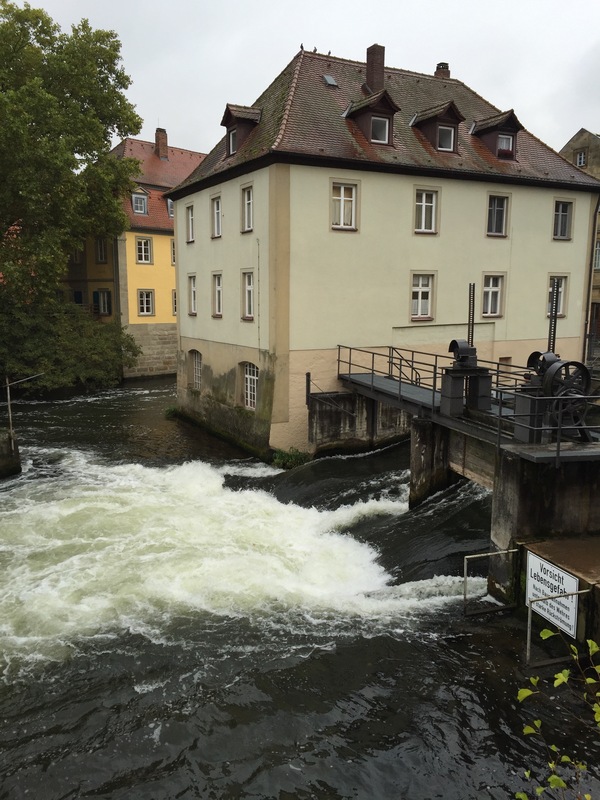 Bamberg is also famous for the local beer with 10 breweries in town and another 80 in the vicinity. 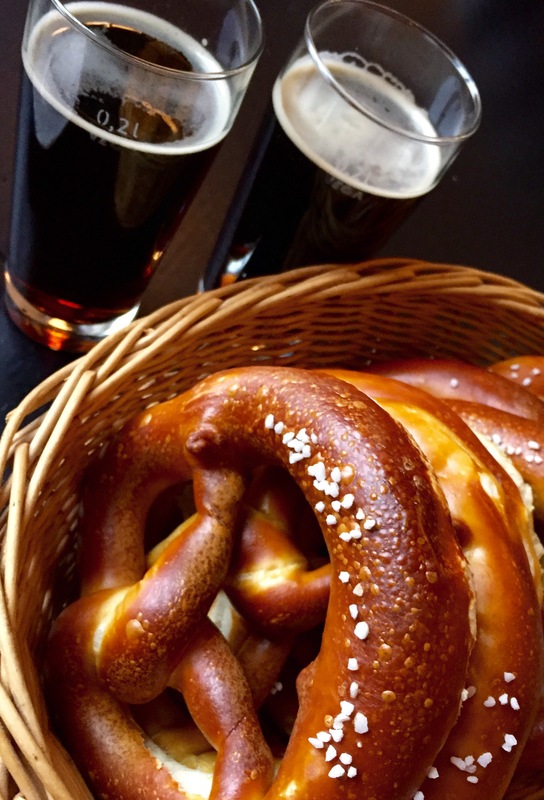 We enjoyed a walking tour with a local guide that ended at a local pub for beer, sausages and pretzels. We had a good bit of free time afterwards and I explored the town a bit. 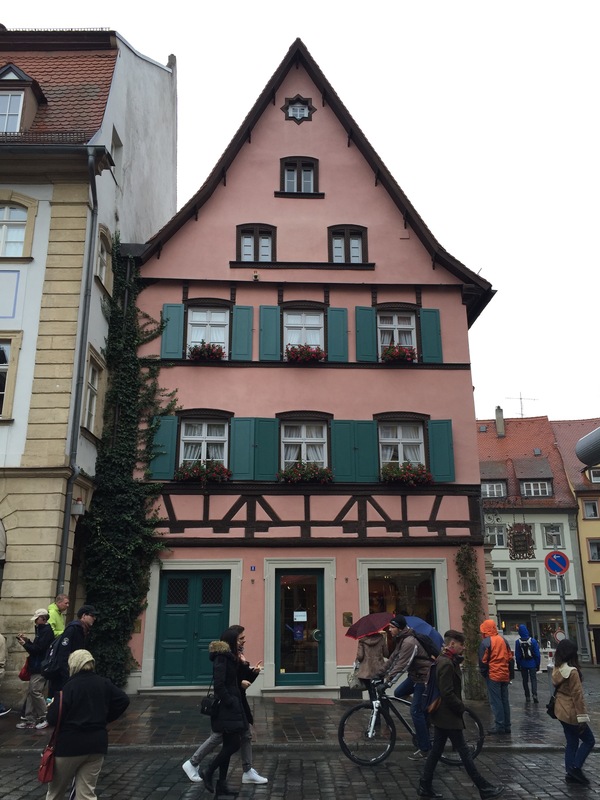 There are many quaint shops and cafés and I enjoyed some time on my own to walk around and get my bearings. 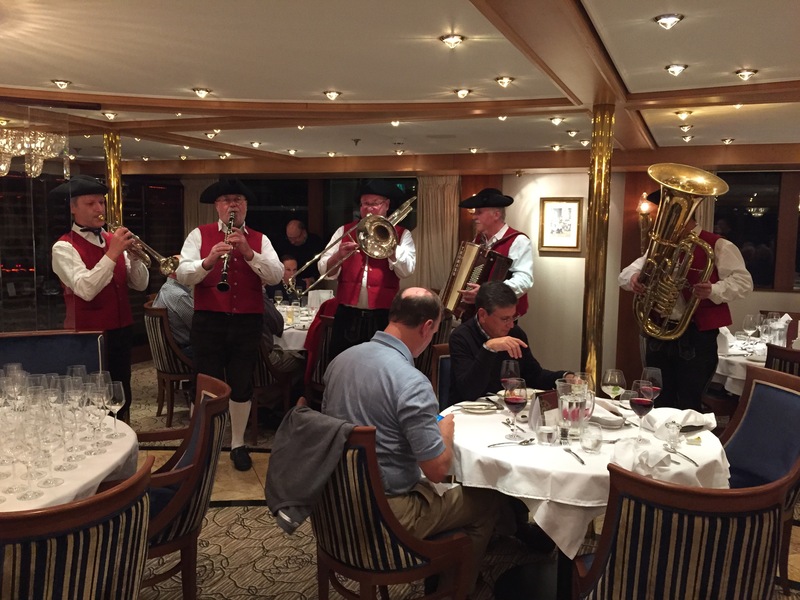 We arrived back at the ship around 7:15pm and went straight to dinner because we had special entertainment arriving at 8:00pm. 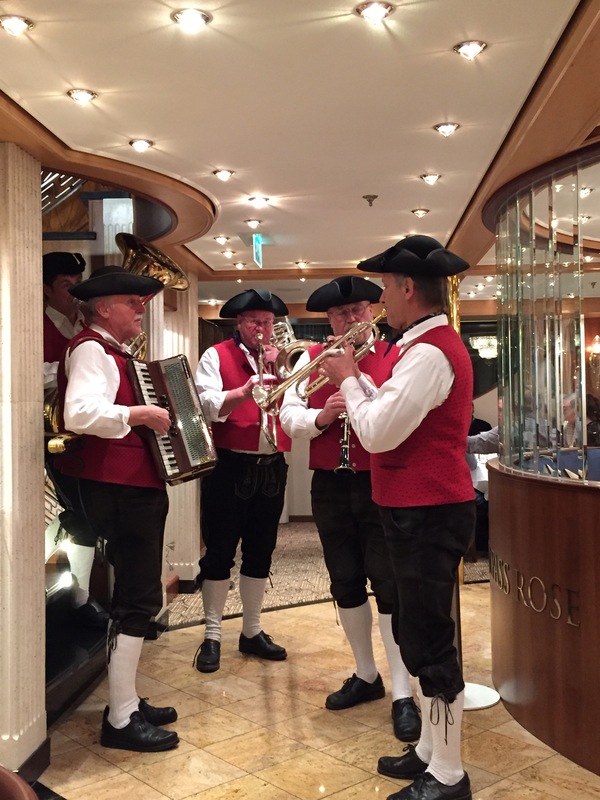 Towards the end of dinner….in came the Oompah Band! They marched, played and sang throughout the dining room and then continued their concert upstairs in the lounge. 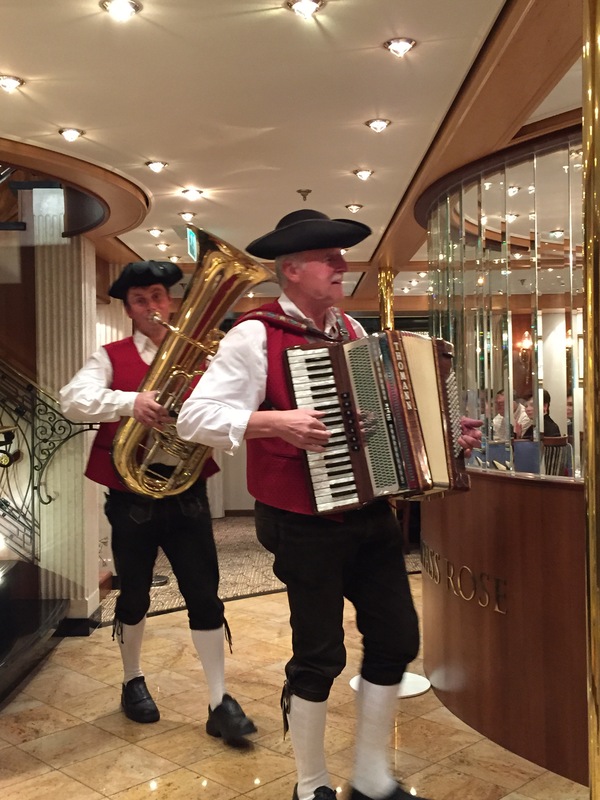 We set sail around 9pm, en route to Nuremberg, Germany. With spending so much time in Germany and German speaking countries, I’m learning a bit of German. Not a language I ever thought I would learn! 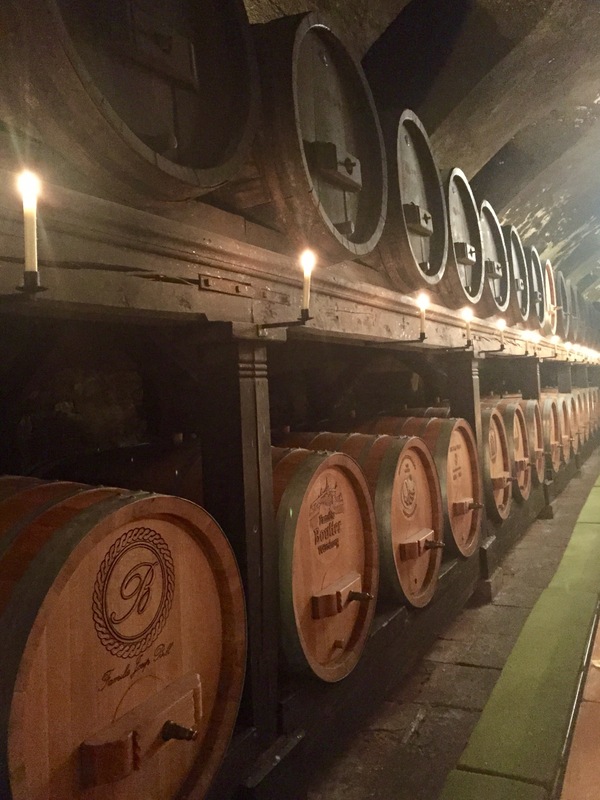 As I head to bed, I wish you a Gute Nacht (Good Night)…. Love you, always- you look great….so happy to see your smiling face!